Thank you for my beautiful IBD bracelet….. worn with the knowledge that IBD is being supported. Very fine pendant bracelet with a silver glitter and waterproof. Very happy with my purchase. At Elizabeth Chandler Jewellery we believe in giving back. We support a number of charities with the intention of raising money and awareness for health conditions. 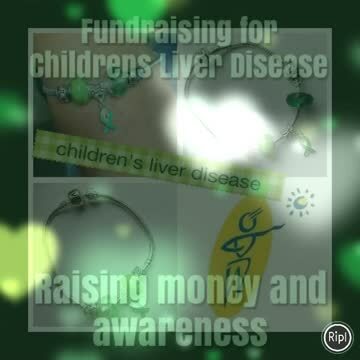 Charity and Awareness Jewellery are at the core of our business. I was diagnosed with Ulcerative Colitis in April 2002. Since then I have experienced all of the many treatments, drugs and emotions associated with it. I have met many other sufferers on online forums etc. I have had lots of information, advice and support from the charity Crohn’s and Colitis UK. For this reason I decided to make and sell my first charity and awareness jewellery. 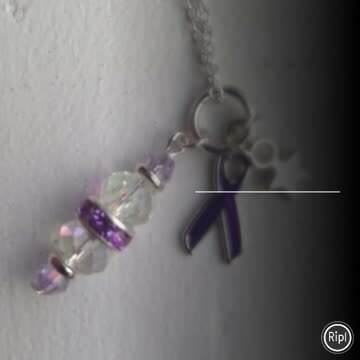 This purple ribbon jewellery raises money for and awareness of Inflammatory Bowel Disease (IBD). Depending on the item, roughly 30% of the price of these items are donated to CCUK. When my nephew was diagnosed with autoimmune liver disease last year, it was an easy decision to make and sell bracelets to raise money and awareness. The money raised goes equally to the Children’s Liver Disease Foundation (CLDF) and the Rays of Sunshine ward at Kings College Hospital in London. The hospital is the leading hospital into he country for treating both adult and child liver patients. Children and babies are born with liver problems, many needing a liver transplant. The CLDF support patients ad families through the trauma of living with serious illness. Thank you for your support. Clic Sargent is a charity that can help when the unthinkable happens. They offer a wide range of services. As a primary school teacher it was them I contacted to ask for advice when an 8 year old child in my class was diagnosed with cancer. The charity were great. They sent a whole pack, including a story book to read to the children. Because of their years of experience supporting children and their families affected by cancer, they were more than able to answer any question that I or my students came up with. Of course there are many other things the charity does, including offering support for siblings of childhood cancer patients.